We were fortunate enough to receive a trio of cans from Michigan’s Perrin Brwing a few weeks back. One of their brews – their N.E.-inspired IPA, Peach Bellini, will be covered shortly. This time out, we had a chance to crack in to their draft-only Blonde Porter. The brew pours with a small amount of head and a yellow to gold coloration. This porter’s initial nose is sweet up front with a bit of grain and malt following shortly after. One’s first sip of Perrin’s Blonde Porter will yield hints of dark fruits, brown sugar, vanilla, and mocha. Hints of bread and wheat come out after with just a hint of bitter elements to refresh one’s palette as they move on to subsequent sips of the stuff. There is still the body, the overall spirit of the porter. There is a richness to the brew that permeates each and every sip. 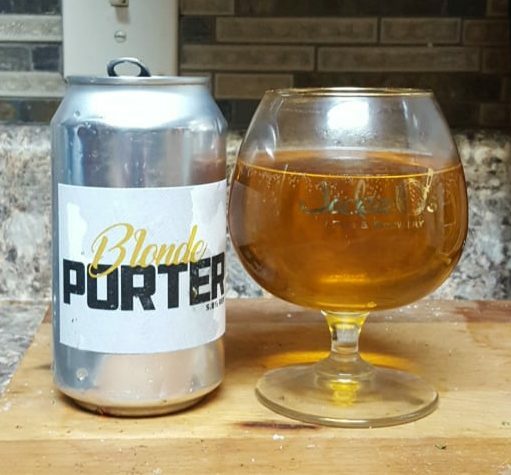 While a bit of the smoke and toasty taste of the style is not quite as prevalent owing to the lack of roasted malt, I feel that the Blonde Porter is a fun refreshing of a style that is typically pretty limited in how it can be expressed. Perrin has made an effort that keeps its overall flavor profile consistent from the first taste until the last quaff of a glass. Check out our previous coverage of a Perrin effort, their Apricot Sour . Additional information about the brewery can be found at the company’s main domain, while up to date news and new product announcements are present on Perrin’s social media profiles.